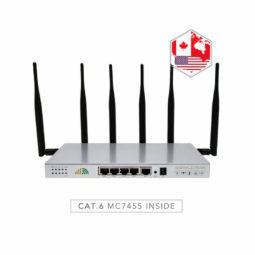 Powered by Cat6 cellular modem MC7455, the American standard outdoor router provides 300Mbps fast speed internet over 4G LTE-A cellular networks. 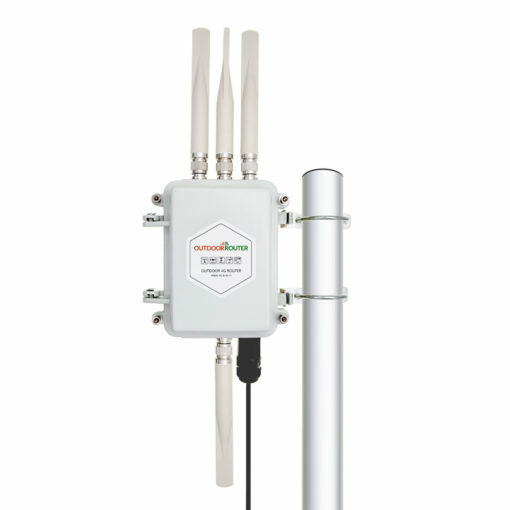 Integrated MIMO technology for both 4G and Wi-Fi, also support LAN Ethernet. Designed for use in remote areas. 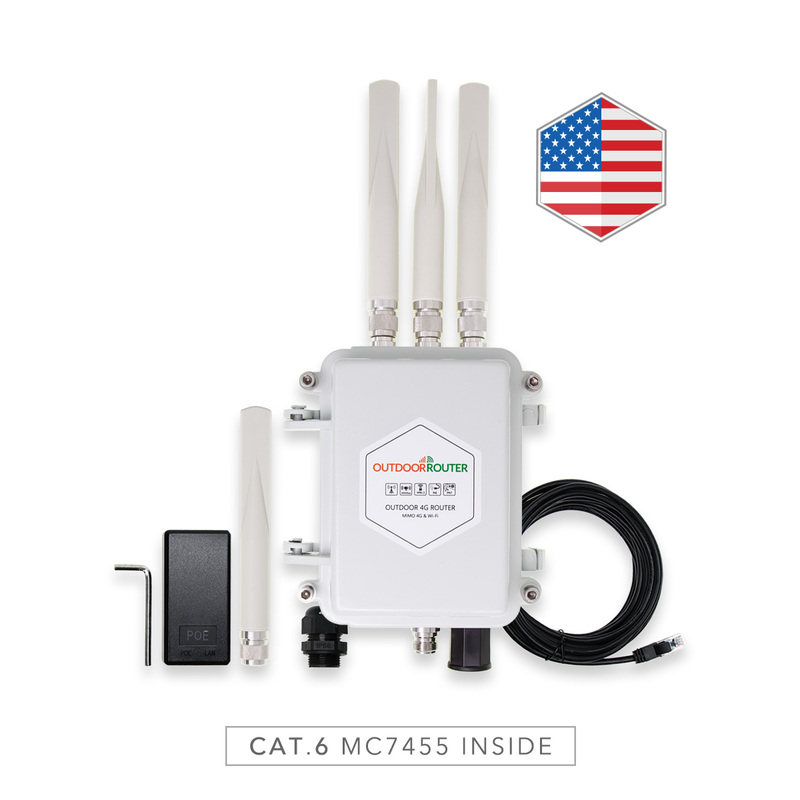 • Cat 6 Sierra 4G LTE-A modem – Support all American mobile networks. • 2T2R MIMO Wi-Fi with 25~27dBm booster. Covers 300~600 feet radius. • PoE power over Ethernet over 100-yard. Included 48Volt PoE. • Inapplicable with locked SIM cards! 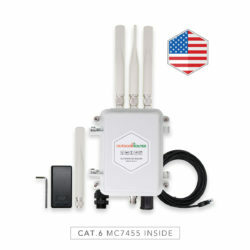 The North American 4G Router uses CAT.6 Sierra MC7455 mobile modem which takes 2x 4G antennas and delivers 300Mbps downlink and 50Mbps uplink data rates. The CAT.6 broadband mobile modem is designed to use in the United States and Canada. Except for 4G FDD-LTE and 4G TDD-LTE, it also supports 3G WCDMA mobile network. The 4G broadband modem is certificated by FCC/GCF/IC/PTCRB. * The SIM card is excluded. * Need to use the unlocked SIM card. Integrated with 25~27dBm Wi-Fi booster, the North American 4G Router covers up to 150~300 yards radius in outdoor open area. Powered by PoE (power over Ethernet), you only need one LAN cable for both power and data. Supports 802.3af/at PoE standards, you can power up the outdoor router with 12~24~48Volt PoE switches over as long as 100-yard LAN cable. The default 24Volt PoE injector and 30-feet LAN cable are included in the package. 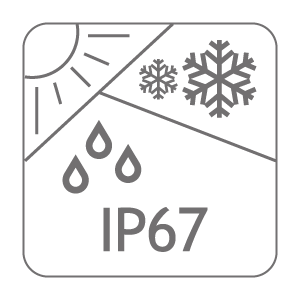 IP67 hardened industrial-grade aluminum alloy case enclosure the 4G Outdoor Router to withstand extreme weather conditions and rugged deployments. The outstanding metallic case could protect the 4G router from dust and capable of withstanding water immersion above 3 foot for 30 minutes.